Rafael Salamanca will run for Maria del Carmen Arroyo's old council seat in the February special election. SOUTH BRONX — Rafael Salamanca, district manager of Bronx Community Board 2 and president of the 41st Precinct Community Council, will join the crowded race to take Maria del Carmen Arroyo’s former seat on the New York City Council. 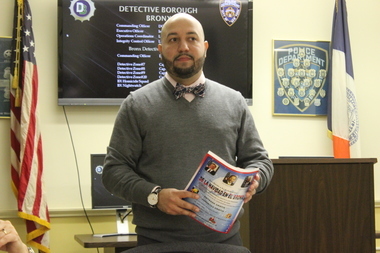 Salamanca has been district manager of the CB since 2010 and president of the 41st Precinct Community Council since 2013. He is a board member of the Community Healthcare Network and the Hunts Point Economic Development Corporation as well. He was born and raised in Longwood, one of the South Bronx neighborhoods that the 17th Council District covers, and he currently lives there with his wife and children. His lifelong experience with the neighborhood will help set him apart from the several other candidates seeking Arroyo’s seat, he said. Salamanca said he was particularly proud of the work he had done on Community Board 2 to help Hunts Point shed its reputation as a hotbed of prostitution by working to close down local strip clubs, an effort that he said made the neighborhood a safer place. He pledged to focus on affordable housing as a councilman not just by making sure that people can afford their rent but also by helping them make sure they can pass their credit checks. He said that having financial advisers give residents a free copy of their credit report would be an effective way to help them pass credit checks. He would also plan to focus on making sure that companies hire locally for jobs and on improving police-community relations, something he has already tried to do through his position on the 41st Precinct Community Council. For instance, he has started holding community council meetings in July and August, which are traditionally off-months for community meetings, and he has started holding them in locations other than the precinct building. Arroyo's resignation took effect on Dec. 31, and the special election to replace her has been set for Feb. 23. Salamanca joins a crowded field of candidates vying to replace Arroyo, including her chief of staff Joann Otero, activist and businessman Julio Pabón, Rep. Jose Serrano staffer Amanda Septimo, preacher and businessman Rev. J. Loren Russell, Human Resources Administration Director of Business Development Anthony Sanchez and union leader Helen Foreman-Hines.